Driving under the influence of marijuana is a serious criminal offense everywhere in the United States. Each state, territory, and federal district enforces laws banning people who have recently consumed cannabis from operating motor vehicles. 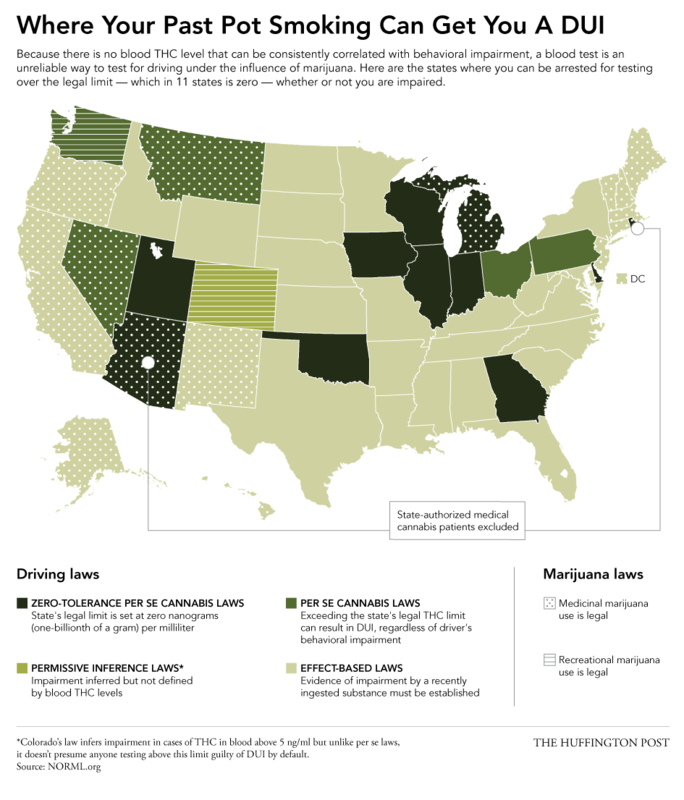 But the specific rules behind marijuana DUI law vary from place to place. Some are more stringent than others, but every state treats driving under the influence of marijuana as a misdemeanor or felony with the potential for jail time. A marijuana DUI charge applies to any motorist who drives while impaired by cannabis (or cannabis combined with another intoxicant). But there is no common definition of “impairment,” so different states apply different standards.  All but a few states apply what is known as a “per se” approach to driving under the influence of cannabis. A blood test is conducted once a driver is arrested to determine the presence of THC metabolites. If they are found in sufficient concentration, the motorist can be charged. This is similar to the per se approach used in drunk driving cases. In all 50 states, a blood alcohol level of 0.08 percent or higher triggers a DUI charge. The per se measurement is used to prove “impairment,” which is defined as being unable to drive safely because of alcohol or drug use. In some states, the discovery of any amount of THC in a motorist’s bloodstream is per se grounds for a marijuana DUI charge. This includes inactive THC metabolites that can be detected hours, days, or even weeks after use. In other words, drivers who are not high can nonetheless be jailed in these places over the possession of lingering, non-intoxicating THC in their blood. In some other states, blood tests must show a minimal THC concentration before per se marijuana DUI charges can be filed. This floor, similar to the 0.08 percent cutoff for drunk drivers, varies substantially between jurisdictions. Finally, a minority of states require prosecutors prove a driver was actually impaired while driving under the influence of marijuana. Prosecutors may seek to do this by establishing erratic driving, slurred speech, or even the smell of cannabis. This is in contrast to states with per se laws, where the mere presence of THC is enough to allow charges. Even in “actual impairment” states, however, the motorist need not break other traffic laws or drive unsafely to face prosecution. For example, a driver involved in a no-fault collision may be arrested and charged with marijuana DUI if police find evidence at the crash scene of recent cannabis use. Some form of medical marijuana is legal in more than half the states, but none has legalized high driving for patients. That means those who use cannabis throughout the day risk arrest whenever they get behind the wheel. But patients are most at risk in states with per se marijuana DUI laws, since these states penalize a motorist for the presence of THC metabolites even when he or she was not high. The key for all medical cannabis patients is to drive conservatively, be aware of all local traffic laws, and carry patient identification at all times. For purposes of marijuana DUI charges, a motorist accused of driving under the influence of cannabis must have been “in actual physical control” of the vehicle. But this definition is much more inclusive than it may seem at first glance. Were the keys in the ignition? Did the driver even have access to them? Was the driver awake or “sleeping off” a bender before leaving sober? Was there gas in the tank? Were the vehicle’s gears engaged? Was the driver sitting in the driver’s seat, the passenger’s seat, or the back seat? A drunk or high motorist stranded away from home should take precautions before sleeping off the intoxication in a parked car. Avoid sleeping in either of the front seats, but especially the driver’s seat. Unless power is required for heat, leave the engine off and keys away from the ignition. Do not park and sleep along highways or in any other place that might suggest you parked after driving under the influence of marijuana. Most motorists convicted of marijuana DUI face at least a criminal fine, as well as jail time in many cases. DUIs are typically misdemeanors, but if a case rises to the level of a felony, a prison sentence is possible. 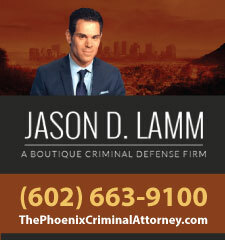 Probation is an alternative to incarceration frequently used in DUI cases. Many states set maximum penalties for driving under the influence of marijuana, but relatively few apply mandatory minimum sentences on a first offense. Subsequent offenses, however, often do carry minimums. Otherwise, judges are generally free to hand down criminal sentences as they see fit. It is not uncommon for first-time defendants in minor marijuana DUI cases to receive little or no jail time. But repeat offenders should expect at least a few days in jail, with increasing terms of incarceration for each conviction.